PDF of the entire issue (3.89 Mb). 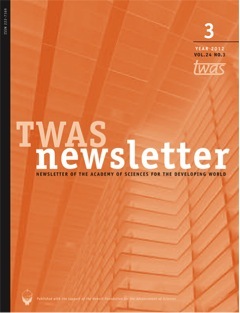 (pages 2-5): TWAS executive director Romain Murenzi about the Academy's 12th General Conference held in Tianjin, China, in September 2012. (pages 5-15): Between 17 and 21 September 2012, TWAS held its business meetings, 23rd General Meeting and 12th General Conference in Tianjin, China. More than 400 scientists from 40 countries attended, mainly TWAS fellows from developing countries. A review of the proceedings follows. (pages 16-21): The 2012 Ernesto Illy Trieste Science Prize, awarded in the field of human health, was presented to Yuk Ming Dennis Lo (Li Ka Shing Institute of Health Sciences of the Chinese University of Hong Kong, China) for his work on non-invasive prenatal diagnosis. (pages 22-25): Brazilian economist Riccardo Paes de Barros is the winner of the inaugural edition of the TWAS-Celso Furtado Prize for Social Sciences. (pages 26-31): More than 60 seminars took place during TWAS’s 23rd General Meeting in Tianjin, where scientists presented a broad spectrum of investigations, from defensive strategies used by plants against parasites, to innovative materials, to future plans to exploit solar energy. (pages 32-35): Wan Gang, minister of science and technology for the People’s Republic of China, outlined – in a presentation to the TWAS conference – how China has so successfully linked its science and technology programmes to development. (pages 36-40): Ecuador’s ambassador to China, Leonardo Arízaga, talks about his government’s efforts to reform the chaotic and ‘unfair’ university system through unprecedented investment in scientific research capacity. (pages 41-45): During the TWAS General Conference in Tianjin, Zimbabwe’s minister for science and technology development, Heneri A.M. Dzinotyiweyi (TWAS Fellow 1988), spoke about the new coalition government’s plans to attract Zimbawean scientists back to their homeland. (pages 46-49): At the TWAS Conference in Tianjin, Wang Sicheng, a senior researcher in solar energy and currently director of the Energy Research Institute at China’s top economic planning body, the National Development and Reform Commission (NDRC), outlined the status of photovoltaics in China and the incentives that the government has put in place to ensure that solar energy becomes a viable alternative to fossil fuels. (pages 50-51): Brief news about honours, appointments, awards and events.